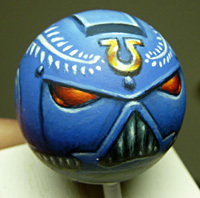 time for another step by step, this time i'll paint a veteran space marine head in the colors of the ultramarines chapter. Before we start i have to say i modified the layout of this tutorial a bit. The finest warriors of the galaxy! Hmmm, while i was looking around for stuff needed for this tutorial i noticed my bits box was kinda empty... no more space marine helmet head. 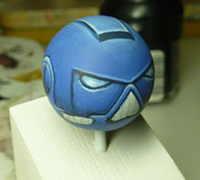 I sculpted a ball and put it on a socket so you could better see it and it's easier to paint it. After this i primed it white. Priming white is good if you want bright, strong colors. 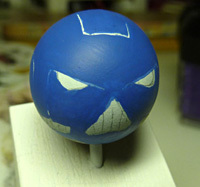 So, we only have a ball because i can't really sculpt a space marine helmet.... we have to paint the whole thing on it. 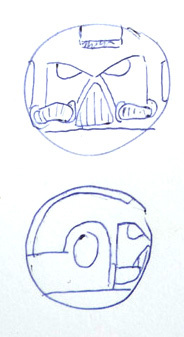 To help me i made a small sketch how a space marine head basically looks. 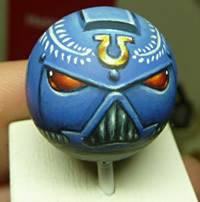 The typical Space Marine as we know him. 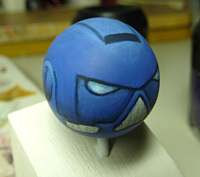 Ok, after that i tried to paint my sketch onto the ball with a mechanical pen. 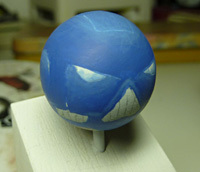 Now we start painting the base layer with Ultramarine Blue. 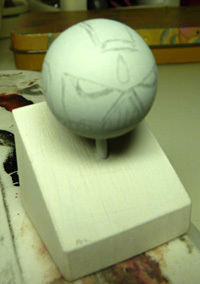 Leave spaces or thin lines so you know where to paint the shadows later. 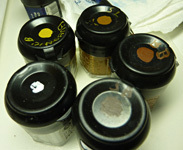 Ultramarin Blue color pigments got shipped over the ocean to europe in the ancient world,that's where the name comes from. (lat. ultramarinus = "over the ocean"). I mixed some Space Wolve Grey into the UB and made some glazes to bring in some light. Now i mixed some Chaos Black with the UB and painted the first shadows and outlines. Pure (but thinned) Space Wolve Grey for edges and strong highlights. As the light is for the biggest part finished, i started with the veteran laurels. To do so i painted two lines with Valljo Ivory. mechanical pen and erase the lines afterwards. After this step i painted the leaves of the laurels and highlighted the laurels using Skull White. 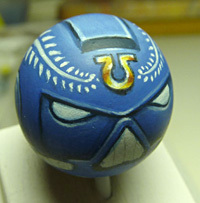 I added a Ultramarine Symbol using Ivory again. 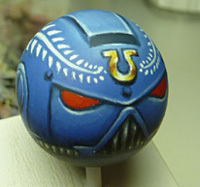 symbol "omega" to get a ultramarines logo. Now we will paint a basic non metallic gold effect on the logo. 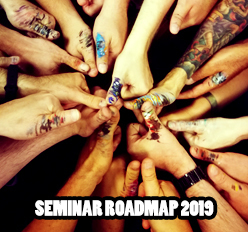 I used the following colors for this: Scorched Brown, Bestial Brown, Snakebite Leather, Bubonic Brown, Skull White. Try to paint some metallic effect using a gradient like i posted above. Chaos Black, Liche Purple? (can't remember), Blood Red, Blazing Orange, Sunburst Yellow. Try using a wide gradient for a good lens effect. I started with a Blood Red/Chaos Black mix to give a medium-dark basecoat. 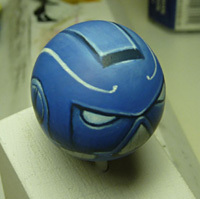 I decided to add some bolts to the helmet and so added some shadow for them. I also started with the non metallic metal hoses on the side and mouth grill using basically Chaos Black, a mix of Chaos Black, Codex Grey and Ultra Blue for the shadows and a gradient with more and more white in it. I continued with glazed of Chaos black into the dark areas and then made a gradient starting with Blood Red, continued with Blazing Orange and ending in Sunburst Yellow. 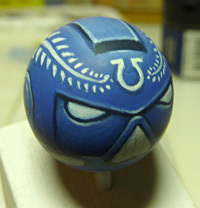 For the bolts on the helmet i added some Space Wolve Grey for the Highlights. I painted the final highlights on the metal parts using Skull White. Using more colors makes the lenses much more interesting. Now the final Step is to add white reflex points. Now just paint the socket with a nice black finish and you're done! I've written some stuff on the base and added my signature. First, this is a really great tutorial. Second you have shown balls (OK one at least and yes it is a bad pun that I couldn't resist) by working the three dimensional effect without any real detail to "detail". Cool, Funny, Educational! 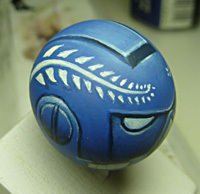 Now paint a banana as an Eldar or a Bell Pepper as an Ork and you will really blow me away!!! Unbelievable, you never have to buy any Space Marines from now on... simply great!